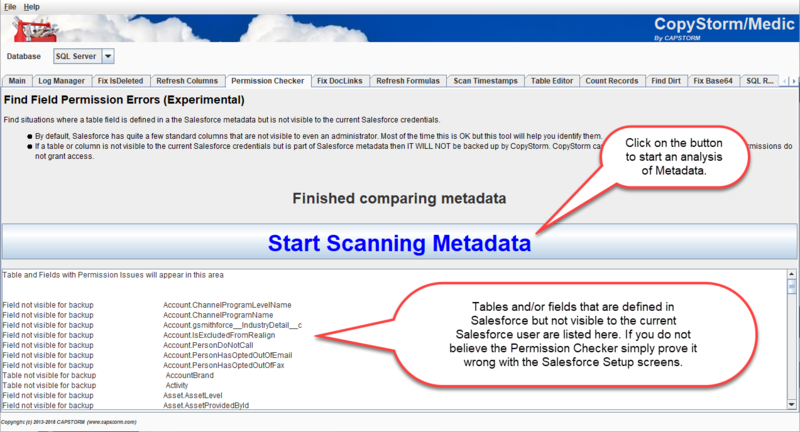 The CopyStorm/Medic Permission Checker will find Salesforce tables and fields that are visible using the Salesforce metadata API but are not visible for backup using the current Salesforce credentials. It is a common misconception that a member of the Salesforce Administrator group can see all table and fields in a Salesforce instance. In practice, there are even many standard Salesforce fields that a Salesforce Administrator cannot view by default. The Permission Checker helps you find these tables and fields. Running the Permission Checker involves clicking on a single button – Start Scanning Metadata. Do not be alarmed when you find a lot of fields that are not visible to a Salesforce Administrator. Most likely you are not using them in your instance.